ARIES often feels smothered by demands of family and even friends. CANCER, on the other hand, is very devoted to family needs and the inner, emotional needs of others. ARIES may, without realizing it, selfishly accept CANCER's nurturing and giving, while contributing relatively little to the relationship on an emotional level. ARIES's need for autonomy and independence often conflicts with CANCER's needs for closeness, intimacy, and mutual dependency. ARIES seems selfish, impersonal, and indifferent to CANCER at times, and CANCER may feel too needy and emotionally sensitive compared to ARIES. ARIES can learn compassion from CANCER, and CANCER can learn to be more independent, but it's likely to be a rough road at times with much adjustment needed on both sides. LEO is the more dominant of the two of you and is likely to take the lead in your relationship - which is fine with CANCER, who has no need to be on top. Both of you are inclined to mood changes that, at times, can irritate each other. For example, CANCER experiences periods of melancholy, tenderness, concern, worry, nostalgia and sentimentality, which VIRGO may not understand or sympathize with. VIRGO can suddenly become irritated and irascible over minor annoyances, and at such times, is capable of intense sarcasm and criticism, which can be extremely disconcerting to CANCER's tender, sensitive feelings. VIRGO must be prudent, and CANCER must strive to be forgiving when things go a little awry. However, you are both capable of enormous devotion to one another (and to your children if you have them), and taking care of one another comes naturally to you. Both of you are thoughtful, considerate, sensitive to, and aware of, other people's needs. Having good personal relationships is very important to both of you, and you make harmony and peace in your personal lives a very high priority. You both avoid conflict and confrontation if at all possible. It is so very easy to attach yourselves to each other! Because each of you possesses a powerful feeling nature and a tendency to bond intensely with important people in your lives, you sense in each other a basic similarity in temperaments and goals. There are differences, of course, in your natures, but this overall similarity can strengthen the bond between you. 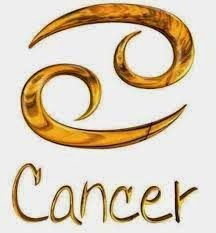 CANCER often feels more compassion and sympathy for others, while SCORPIO may view CANCER's feelings as sentimentality. When wounded, SCORPIO sometimes tends towards being resentful. CANCER, on the other hand, is more apt to sulk or withdraw when hurt, and usually lets the other person know (generally in a nonverbal manner!) about it. SCORPIO, by contrast, hides hurt more readily. Your natures are so different that you are bound to clash at times. Very often when SAGITTARIUS feels the urge to travel, explore, expand, and follow a new star, CANCER feels just the opposite: the urge to be close to family, to establish roots, to have children and provide for them, to be near close friends. SAGITTARIUS's desire for freedom and exploration is often at cross purposes with CANCER's need for security. SAGITTARIUS tends to also be philosophical and detached about personal matters while CANCER takes a much more personal, subjective, compassionate, and emotional approach to life. Although in theory your differences can complement each other, and sometimes they do, there are times when you will have to be very creative and imaginative to find ways to meet everyone's needs. In many ways the two of you are opposites. CANCER needs a lot of domestic and family activities. Nurturing others and personal involvement with others is a necessary part of life for CANCER. Family and close friends are extremely important for CANCER, while CAPRICORN often becomes emotionally detached from personal affairs and may fail to fully appreciate CANCER's more personal, emotional responses to situations. CAPRICORN may seem dry and perhaps overly ambitious to CANCER. Your differences can serve to complement each other only if you really understand and appreciate each other. Both of you do seek security, consistency, and fidelity in relationships, so there is a reasonably good chance that over time you will develop a greater appreciation for each other's opposite qualities. The differences between you are: PISCES's sympathies are more broad and universal than CANCER's, who is more concerned with family or others who are personally dear to CANCER. "Our family" or "our circle" matters more to CANCER than to PISCES, who treats friends and strangers more equally. PISCES can be a little lax when it comes to remembering significant personal dates, like anniversaries or birthdays, whereas CANCER never is. Fortunately this difference is rather minor and unlikely to be much of problem between you.